Where is Ajo? Well it's not exactly past the end of the earth, but almost. You travel through it on highway 85 on the way to Organ Pipe National Monument. The town was designed and built in the early 1900s for mine workers in the nearby Cornelia Mine...an open-pit copper mine. The word "ajo" means "garlic" in Spanish. The town may have gotten its name from Mexican miners mispronouncing the Pagado Indian word for the place, "au'auho" meaning "paint," because the mine ores were a source for red paint. John Greenway bought the mine in 1911 and designed the town to keep workers content and productive. The design centers on the town plaza, with wide streets radiating symmetrically from an axis like "wings of a bird." The Spanish Colonial architecture of the buildings features arches, stucco surfaces, towers, and tile roofs. Two churches grace the perimeter of the plaza, a Catholic Church on the left, and the Federated Church on the right. Curley School (named for the mine manager) was built in 1919. It features a bell tower, curriculum medallions, and a "wise old owl" over the doorway. It has been renovated and is currently being used to house artists in residence. View toward the plaza from the school steps. Costa's Hummingbird in the tree outside the school. Esperanza Avenue homes show Prairie influence featuring horizontal lines...so says the brochure. I just liked all the flowers. The Federated Church was built in 1926. Notice how the top of the doorway was cut. Stained glass window on the side of the Federated Church. Immaculate Conception Catholic Church was completed in 1925, constructed of adobe. An imaginary line from the flagpole in the plaza all the way to the cross on the mountain forms the axis of the city plan. Morondo Street across from the Catholic Church features a row of Spanish Colonial Revival homes, locally called "Territorials." The buildings along the plaza have shops and cafes today. This building once housed a movie theater. This side was once the railroad depot, which now houses the Visitor's Center. Walking toward the old depot building. Beautiful flowers and landscaping all over town. View from the depot/visitor's center. We should have visited here first and picked up the walking tour brochure. I found out we missed a lot. Too bad we're going to miss the "Shindig" in March. The Coyote howling contest sounds like fun. Driving out of town we can see the copper tailings from the mine. 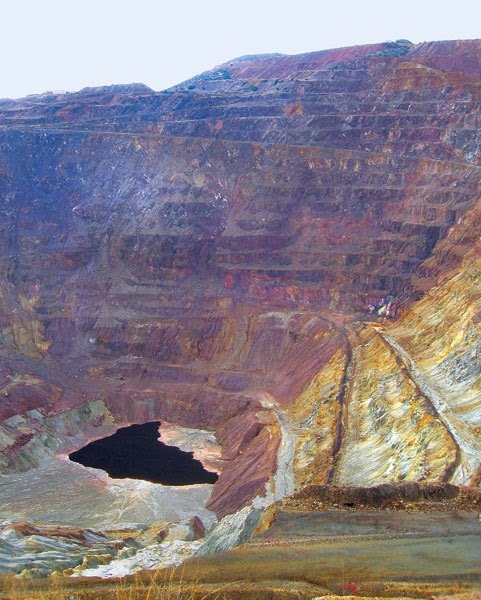 At one time, New Cornelia was the largest copper producer in Arizona, and the 3rd largest open-pit mine in the US. It closed in 1984. We passed by the little town of Why, named for the "Y" intersection of highways 85 and 86. Next post will be from Organ Pipe National Monument. I have read many blog posts written by people going through Ajo but none of them gave the great visual tour you did. Wonderful post as always.